SEOUL, SOUTH KOREA, March 13, 2019 — It has been 20 years since the Seoul Metropolitan Government established the Information System Bureau in 1999 to implement its ICT-based urban management and operation policies. Since then, Seoul has been enjoying the world’s best e-government city status for the seventh consecutive time. Now the Seoul Metropolitan Government said that it will leap forward towards a leading smart city based on big data as well as advanced information communication technologies. The core of the city government’s “Smart City, Seoul” project lies in “big data,” one of the untapped valuable assets, often called “the new oil of the 21st century.” So far, under the name of “information technology,” the Seoul Metropolitan Government has been providing public services including “Owl Bus (late-night bus),” public Wi-Fi, and mVoting. And now it aims at combining the world’s best ICT technologies and infrastructure and the city’s accumulated administrative data with key technologies of the fourth industrial revolution, such as Internet of things (IoT) and blockchain, to create a new growth engine and provide new services that have never been before. It has a plan to digitize a diversity of urban phenomena and the citizens’ movements as well as the administrative data that it already possesses so that the citizens and businesses alike utilize it to make changes in the lives of the citizens. To achieve this, 50,000 IoT sensors are to be installed throughout the city. In the transportation sector, the Shared Parking System, a one-stop parking system, will be introduced using these sensors to relieve chronic parking problems. The sensors help people check availability of parking spaces in real time with a smartphone application and reserve the space and pay parking fees. Even when establishing infrastructures, such as welfare facilities for senior citizens, the data of the floating population will be analyzed to decide where these facilities are needed. 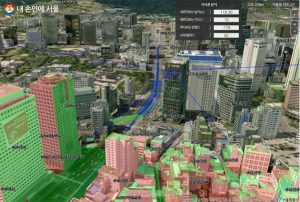 When building a city development plan or constructing a new building, the city government simulated how it would affect the existing urban environment using the “3D-based Virtual Seoul” to upgrade the city’s urban management policies. The “Chatbot” function that automatically answers the citizens’ questions with artificial intelligence (AI) technology will be pilot-applied to 120 Dasan Call Center within this year, and “intelligent surveillance cameras (CCTVs)” will be also introduced to analyze video clips using big data and AI technology, automatically monitoring brawls, arson attacks and other forms of misconduct. Seoul’s smart city project will be carried out with 18 strategic tasks in the following six categories: ① Administrative Services, ② Transportation, ③ Security, ④ Environment, ⑤ Welfare, and ⑥ Economy. Smart administrative services that analyze and merge urban data to make optimal policies that meet the citizens’ demands, like “Owl Bus,” will be further expanded. With a goal of fully opening public data held by the Seoul Metropolitan Government and its affiliates by 2020, it will open data of 170 systems this year, including comprehensive support programs for small businesses, general information on MICE, and performance management, which have high preferences of the citizens. For the last three years from 2016 through January 2019, around 5,200 data were disclosed, which were used by approximately 6.9 billion people, and based on which 171 apps were developed by the private sector. As many as 50,000 IoT sensors will be installed throughout the city by 2022 to collect data on fine dust, noise, wind, and night light intensity, floating population, traffic movement and other matters that affect the life quality of citizens. In addition, the Integrated Public Big Data Storage is expected to be established within the year in order to store, analyze, and utilize the city data collected through the sensors and administrative data (518 types of administrative systems, 3 Peta Byte) currently possessed by the city government. For example, based on the data in the Integrated Public Big Data Storage, the city government will be allowed to analyze the data of light intensity at night secured by light sensors to make a policy to ensure safety at night; and to look into regional heat wave or cold wave to determine the location of installation of shade canopies or heating cables on icy roads. In addition to a function of storing source data, the Integrated Public Big Data Storage uses AI technology to classify and standardize the data in order to determine which data to use in which field. The Seoul Metropolitan Government will also have a plan to establish the Public-Private Big Data Platform that enables to jointly use private sectors’ big data, for instance, finance, logistics, online portal sites, and telecommunication, by 2020. Such schemes are expected to promote the big data industry’s ecosystem in Korea, which is still at its early stage, and also maximize the value of use of the big data. Prior to the full-fledged establishment of the Public-Private Big Data Platform, the Seoul Metropolitan Government will conduct trial projects with eight private companies this year. For example, it is developing the sales price data for small-size apartment houses with converged real estate data owned respectively by public organizations and financial institutions. This attempt will help provide transparency in the real estate market, promoting residential stability by offering the market price of small-sized apartment houses which have relatively less housing transactions than high-rising apartments and difficult to get the market prices. Another example is the introduction of chatbots at the city government-run 120 Dasan Call Center service. They automatically answer citizens’ questions via text message by using artificial intelligence (AI) technology – they create the database of main interests of the citizens and use deep-learning technology to increase the accuracy of the answers, enough to give the information on Arisu, Seoul’s bottled tap water, the reservation service for public services, and recommendations for lifelong learning programs. Also, the voice-driven AI meeting transcript system will be established within the year. It converts voices into text messages in real time. The city government will work with private businesses to increase its accuracy of voice recognition and text conversion so as to expand it to AI interpretation services. In the transportation sector, in addition to the world’s first 5G convergence self-driving test bed to be completed in Sangam Digital Media City (Sangam DMC), Seoul, in June 2019, the IoT-based shared parking system in which smartphone users can check availability at public parking lots, and AI Taxis are expected to be launched this year. IoT-based shared parking system: Its pilot operation will start at 500 public parking lots this year and will be expanded to 3,000 by 2022. With an IoT-equipped sensor, smartphone users can get the real-time information on availability of parking spaces via Seoul Parking Information app. They can also make a reservation of the space, get the route information and pay the parking fee at once. AI Taxi: It is a system that predicts the demand of taxi in real time by analyzing the information on taxi’s pick-up and drop-off, weather, demographics, commercial areas, and public transportation. Taxi drivers are able to check out the nearest place where there are many potential passengers directly from the taxi meter screen. These AI taxis is now being pilot run with 380 taxis from five taxi companies since November 2018. Based on the feedback of the trial operation, the system will be improved and expanded to all taxis in Seoul. The Smart Seoul Safety Center will be installed and operated at S-Flex Center in Sangam-dong, Seoul this year to share video clips of surveillance cameras, so-called CCTVs, managed and operated by 25 autonomous district offices (“Gu Office”), with other public organizations including the Seoul Metropolitan Government, the police, and the fire department. In the event of a crime or a fire, CCTV information will be shared immediately to ensure quicker response and secure the golden time. A total of 17,820 units of intelligent CCTVs for crime prevention will also be introduced by the end of 2021. These CCTVs analyze videos with big data and AI technology and monitor certain situations such as fights and arson attacks. If any dangerous situation is detected, it sends an alarm to the police or fire department. The Seoul Metropolitan Government is committed to strengthen walking safety for the transportation vulnerable including elementary students, senior citizens and “smombies,” or smartphone zombies, who walk without attention to their surroundings because they are focused upon their smartphone, by installing the Smart Crosswalk that LED-assisted traffic lights are installed on the nearby surroundings. Such a measure is believed to be effective in reducing the number of traffic accidents. Urban management system also becomes smart. 3D-based Virtual Seoul that displays urban environments of landscapes, buildings and installations in a virtual reality space and simulates changes of the city will be established by 2021. When a city drafts a development plan or plans to construct a new building, Virtual Seoul helps get to know how such a change would affect the existing urban environment. IoT-based smart plugs will be installed on the air pollution prevention facility at car painting shops to detect if they are using it or not. The installation will be tested at a total of 139 shops located in the Seongdong-gu neighborhood. The smart plug monitors electricity usage in real time without on-site inspection. In Magok, where a pilot smart city complex is being created, telecommunication, safety, transportation and disaster management infrastructures including 109 public Wi-Fi zones, 257 CCTVs, and one broadcasting equipment for disaster prevention will be set up by upcoming June. At the Seoul Botanical Garden that will be officially open in this May, 20 solutions will be intensively introduced. They include smart lighting that automatically controls brightness by detecting pedestrians and unmanned counting system that counts the number of visitors in real time. Support for the socially disadvantaged people including the elderly and the disabled and health care services for vulnerable citizens will be further enhanced by smart technology. Risk situations will be detected for the elderly who lives alone by measuring the power usage at home and the system that shares medical records among the city-owned hospitals and health centers using blockchain technology will be developed. If there is no change in electricity usage, for instance, for TV or electric cooker at houses, real-time care service alarm is sent to a social worker involved. Such care service will be operated for 1,000 households this year and will be expanded to 4,000 households by 2022. If agreed, the system that shares medical records among the city-owned hospitals and health centers will be developed. This is applied with blockchain technology that cannot modify data and ensures security of data. It is expected that these schemes would help save medical fees and enable to have customized health care services. Seoul will realize a “universal telecommunication welfare” that Wi-Fi can be used anytime, anywhere by expanding installation of public Wi-Fi. By 2022, Wi-Fi will be installed at a total of 1,240 community centers in residential areas where rooftop rooms and old city centers are concentrated. On the city bus, which is used by an average of 1.18 million people per day, it will be pilot installed on 50 routes this year and will be expanded to 250 routes next year, considering the convenience of demand and convenience. Wi-Fi was installed on 270 city buses last year, and on 7,405 buses, the entire buses of Seoul, by next year. The speed of Wi-Fi on the subway will be improved so that it can be used 120 times faster than the current service. Based on innovative ideas and technologies of private companies, the Seoul Metropolitan Government will solve urban problems; establish a “cooperation” system so that small and medium-sized companies and venture businesses can participate in smart city-related business; and create an industrial ecology of smart city. “Smart Seoul Cooperation System,” an online platform that one-stop services will be made from suggesting ideas to carrying out commercialization, will open in May. The Seoul Metropolitan Government is pushing ahead a 45.5 billion won project to provide innovative technologies and public test beds to small and medium-sized venture companies that have no performances but have innovative technologies. In order to foster new industries and create jobs related to smart cities, Smart City Funds will be created worth 250 billion won by 2022. Based on the Smart Seoul Cooperation System, citizens and experts come up with ideas regarding smart city, and then businesses suggest solutions, which is evaluated by experts to be commercialized. The Seoul IoT Center, an organization that supports businesses in the field of Internet of Things, will be renovated as the Smart City Center in September to provide general supports to smart city companies. It selects 300 companies per year and intensely supports for their business expenses, prototyping, and international marketing. In addition, the Smart City Showroom, where Seoul’s smart city policies and smart city solutions are experienced will be opened within the Sangam-dong S-Flex Center by the end of this year. It is also going to start the Smart Citizen Lab project that allows citizens to propose ideas and develop smart city solutions to realize them as policies. It will invite 20 communities to support the costs of developing ideas and community promotion programs. 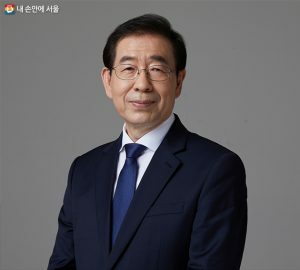 Mayor Park Won-Soon said, “Smart City can be the most useful way to improve the quality of life for citizens in the fourth industrial revolution. It is also a very effective tool in solving global urban problems. It is too to Seoul with the world’s best ICT technologies.” He added, “The Seoul Metropolitan Government will implement the Smart City Seoul Plan centering on urban administration, transportation, safety, environment, welfare, and economy in the daily life of the citizens. We will do our best to make Seoul the most advanced smart city in the world, going beyond the world’s best e-government.